Paul Ehrlich has established Building Intelligence Group an independent consultancy, whose primary purpose is to help system suppliers as well as building owners and managers, manoeuvre their operations through the vast changes prompted by enterprise building management. The main focus is in the areas of facility and IT integration, convergence and intelligent buildings with additional plans of exploring options related to next-generation real estate and technology development. At BuilConn 2004, Mr. Ehrlich was honored with a Buildy Vision Award for his perseverance in promoting whole building integration and interoperability through advocacy, promotion, educational and training endeavors. Ehrlich: In the past we have always considered buildings to be operated in a largely standalone manner. The concept of Enterprise Integration is that groups of buildings can now be centrally managed and also that we can connect Building Systems to Business Systems. Ehrlich: Systems integration is the process of connecting building systems together within a facility to provide a common user interface and also to achieve functionality between systems. Examples of systems integration are connecting all of the HVAC equipment together into a cohesive system or connecting together card access, lighting control and HVAC so that when an employee swipes their card after hours the lights and HVAC come on. Enterprise integration is more at a management level. For example an Enterprise Integration may look at all of the energy use from a group of buildings in several states, read utility rates in real time, and then place all of the buildings into a particular energy saving mode based on the rate. A second example would be bringing critical building parameters up to the enterprise then using that information to make maintenance decisions. Ehrlich: We see owners with large portfolios of buildings already using or looking to use these systems. For example �big box� retailers, college campuses and large corporate real estate owners. Sinclair: Are Enterprise Integration products available? Ehrlich: We are starting to see the products available today. Several BuilConn sponsors are offering solutions. For example the winner of the Buildy for best new product at the BuilConn 2004 was an Enterprise solution from WebGen. Sinclair: How does the concept of Facility Enterprise Integration tie into other Enterprise applications such as Enterprise Resource Planning systems (ERP)? Ehrlich: What we are finding is that the integration of Building Systems are one of the last portions of business to be connected. 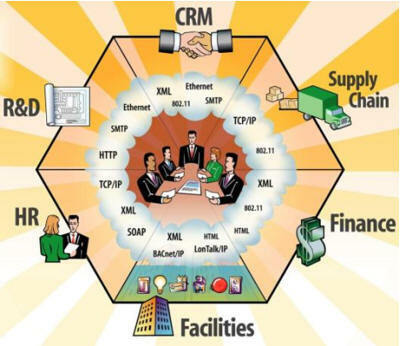 Other critical business functions such as Human Resources, Finance, Sales and Marketing, and Manufacturing have been connected to Enterprise applications as a matter of course. Management of the facility � a major organizational asset � has largely been done at a local autonomous level. Beginning to connect facility systems to the enterprise offer the benefits of better reporting, control and management of not just energy costs � but the ability to monitor comfort, productivity, safety, and to reduce operating expenses. Sinclair: Earlier you mentioned how building systems could connect to make maintenance decisions, how would this work? Ehrlich: Most organizations today have some type of maintenance management system (CMMS). Using Enterprise Integration these systems can read critical building system parameters such as run time, starts, and alarms and then create the appropriate work orders. We are starting to see new applications that will actually look at how the equipment is running and determine if maintenance or programming changes are required and estimates of the avoided downtime and energy savings. We expect this to become a �killer application� for facilities! Sinclair: Why hasn�t this been done in the past? Ehrlich: Enterprise Integration becomes possible due to the convergence of open systems, IT data standards, and Internet Connectivity. Bring these technologies together along with a drive for improved efficiency and you have a broad new range of solutions that will eventually be used in all facilities. Sinclair: Who should attend the sessions for Enterprise@BuilConn? Ehrlich: This track is oriented toward all attendees. For owners and consultants they will learn about the benefits. For Manufacturers and System Integrators, they will learn how Enterprise solutions will be providing them with a valuable new revenue source in the future.